Louis Oberman, wife Lena Todras, had six children; Joseph, Dora, Jack, Edward, Fanny and Rose. They originated from Kadan (Keidani) in the county/province of Kovno (Kaunus) in Czarist Russia (Today Lithuania). Louis Lena and Joseph arrived in Melbourne, Victoria, Australia on the S.S. Elberfield (Albertfield?) in 1892.Louis b. 1857 d. 1905 Broken Hill, New South Wales, Australia.Lena d. 1934. Adelaide, South Australia.Joseph b.Keidani 1888 d. Adelaide, South Australia 1943.Three sons, Solomon, Leo and Jack. Dora married Sam Gild and had a daughter Lorraine Trytell. Jack (Jacob) b. 1892 Ballarat, Victoria, Australia. Edward Henry b.1894 in Ballarat, d. 1965, Perth, Western Australia m. Mildred Helen Carter.Fanny b 1896 in Ballarat, m. Mr. Silverman Son Philip. Rose b. Ballarat m. Mr. Dixon (Dikstein) Son Ronald Maxim Philip (Yeheskiel ben Yehuda Feivel) Oberman b. 1900 Goldigen, Latvia d. 1970 Perth m. Rachel (bat Yitzhak) d. 1946 Perth Cousin of Louis arrived 1926 aboard the SS Jervis Bay. Aaron Avraham Oberman (Hoffman? ), Children, Max, Louis (Baer Leib). Aarons’s siblings; Isaac Oberman, Ira Ora Oberman (Hefferman? ), Mary (Miriam) Hoffman (Nathanson), Either Isaac or Ira went to South Africa. Yossef Oberman .Yossef came to New York in 1902 with his wife Chane. He was 21 and she was 20. They sailed on the Barcelona. From The All Lithuania Database Tax and Voters Lists. Abram Shloima, Orel and Chonel Oberman lived in poor circumstances in 1877 in Skaudvile, Kaunas Guberniya. In 1885 Abram Shloima ben Shmuel lived in Skaudvile. In 1914 Abram Oberman lived in Vainutas, Kaunus Guberniya. Eizik Oberman 1872 Skaudvile, Lithuania. Jewish History of Lithuania. (Adapted from 1938 Edition of Vallentines Jewish Encyclopedia.) In 1938 the Jewish population was about 155,000 that is 6.6% of the population. During the 14th. Century, with the district of Vilna as a nucleus, the Grand-Duchy of Lithuania extended from the Baltic to the Black Sea. Jews had traded with and in the more limited territory as early as the 8th. Century. The origin of the Jewish population is the same as that of Poland though during the earlier period the Jewish inhabitants seem to have been predominantly of Eastern origin. The pagan dukes treated them well. Under the influence of Polish and Bohemian Jews driven Eastward by unfriendliness at home , the Lithuanian Jews were granted in 1388 a charter modeled on that of Poland. The same influences were responsible for the development of Jewish communal life. The Jews were farmers and artisans. Some prospered as managers of estates and tax-farmers. Even after the union of Lithuania and Poland, the Jews of the Grand-Duchy were better treated by the Yaghello Dynasty than were the Jews of Poland. Either because he fell under the Catholic influence or because he sought to free himself from debt, the Grand-Duke Alexander expelled the Jews from Lithuania in 1495, but permitted them to return, and resume their former place in 1503. For another generation their situation remained excellent. In 1514 Sigismund I appointed Michael Josephovitz prefect over all the Jews of the Duchy. The agitation against them by the Church and the lower nobility began to show results toward the middle of the 16th. Century. In 1539 they were accused of secret proselytization. In 1564 and 1566 ritual murder charges were brought against them. The charges having been proved false, King Sigismund Augustus issued a decree forbidding the raising of similar charges. But the nobility enacted a decree in 1566 restricting Jewish dress and occupations. Even after the complete union of Lithuania and Poland in 1569 the kings continued to protect the Jews and to re-issue their charter of privileges. Nevertheless, their position continued to decline throughout the 17th. Century. It was completely destroyed during the Chmielnicki uprising and though temporarily improved during the reign of John Sobieski (1674 – 1696), it never recovered. 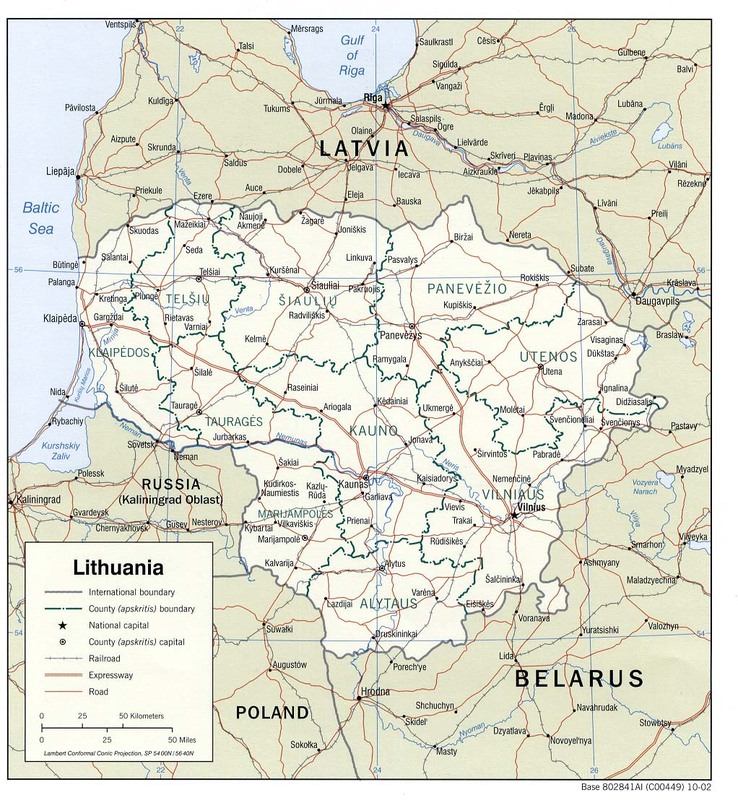 In 1793 Lithuania became part of Russian territory. The Polish insurrections during the 19th. Century badly affected Lithuania and its Jews. After WW1 Lithuania resumed an independent existence but much reduced in size. Vilna and Grodno were taken by Poland while part of the Gubernia of Minsk went to Russia. The new government undertook in 1919 – 1922 to work in harmony with its Jewish population and established a Ministry of Jewish Affairs. Within a short period (1923), however the government changed its position abolishing the separate ministry (1924) and placing difficulties in the way of Jewish economic life. From 1925 the powers of the Jewish community were restricted. The use of the Yiddish language was curtailed. Because of the general shrinkage of agricultural commerce and because of the government’s monopoly in liquor, the economic life of the Jews deteriorated. About 10% of the Jews were engaged in insecure small-scale agriculture. Jews owned paper mills, corn mills, and rubber works. They conducted their own school system with the support of the government. There were schools using Hebrew, Yiddish and both languages. The sorry end of the Jewish population in Lithuania is modern history.